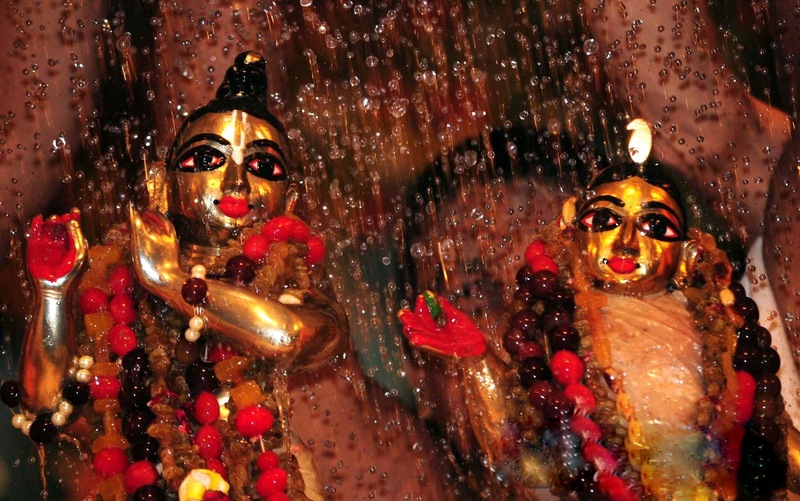 Ever wondered how Sri Krishna Janmastami is celebrated in Sridham Mayapur, the spiritual headquarters of ISKCON? Ever had the good fortune to personally participate in this absolutely wonderful festival? Read on to get a glimpse. 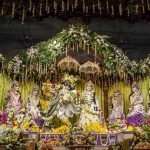 Tens of thousands of devotees and pilgrims gather in Sri Mayapur Dham every year to celebrate the auspicious appearance day of the Supreme Personality of Godhead, Lord Sri Krishna, who is worshipped in ISKCON Mayapur as Sri Madhava. 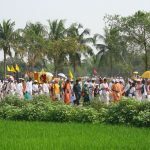 Between fifty and sixty thousand pilgrims come from all over India to participate in the grand Janmastami festival, and as a result, the Mayapur guesthouses are usually fully booked two months in advance. Many pilgrims end up setting up camp outside, not to be deterred from attending this festival and taking the darshan of Sri Madhava on His appearance day. 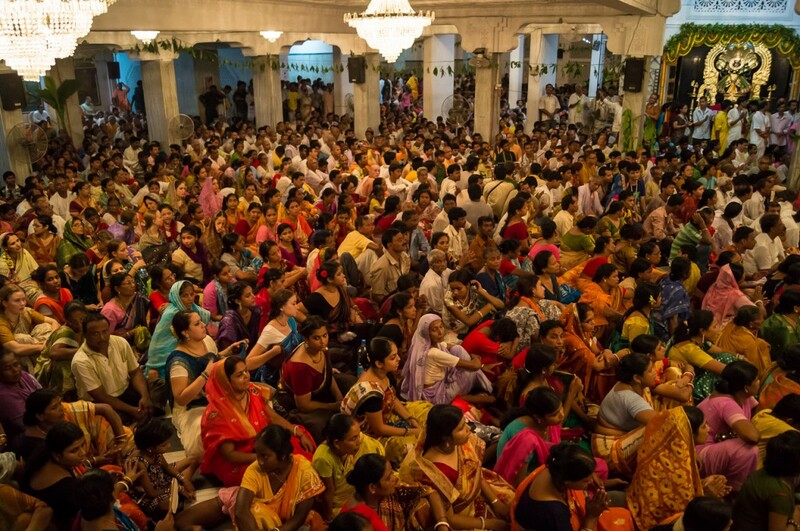 To prepare the minds and hearts of the devotees of Mayapur for Janmastami day, the devotees are absorbed in Krishna-katha every morning during Srimad Bhagavatam class for the week leading up to Janmastami. The day before Janmastami, an auspicious Adhivas ceremony takes place in order to invoke auspiciousness for the festival to follow. 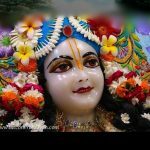 On Janmastami day, Sri Sri Radha Madhava and all the deities of Mayapur are offered a new dress, and Their altars and the temple are elaborately decorated. Many of the devotees of Mayapur write sweet ‘birthday cards’ for Sri Madhava, and present thoughtful gifts to Him, which are placed at His lotus feet and remain there until the end of the day. Lord Krishna, during His manifest pastimes, set the example for everyone by perfectly performing the duties of an ordinary human being. 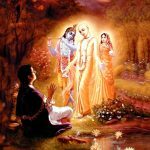 Thus, Sri Krishna received all the requisite samskaras of Vedic society, and in Mayapur, all these samskara ceremonies are performed for Sri Madhava on Janmastami day. A young child is selected to represent Madhava, and a qualified husband and wife to represent Nanda Maharaja and Mother Yasoda, who perform the samskaras for Sri Madhava according to Srila Rupa Goswami’s Sri Krishna Janma Tithi Vidhi, a book that describes in intricate detail how to perform the proper worship of Sri Madhava on His appearance day. At the beginning of the ceremony, Sri Madhava is brought down from the altar and seated on a beautifully decorated throne, and is given a wonderful reception. Priests then start a yajna and perform all of Krishna’s samskaras. 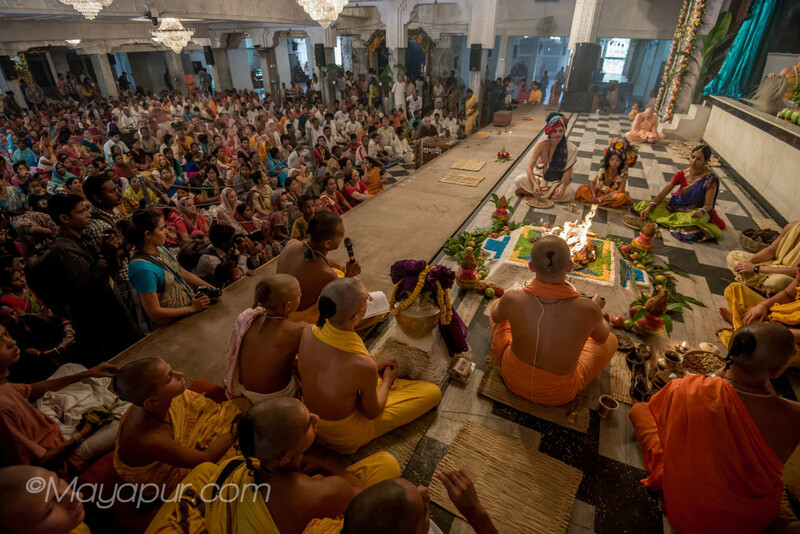 They begin with the Jata Karma ceremony, in which Nanda Maharaja and Mother Yasoda perform a fire yajna for their newly born son and pray for His protection. After that, they perform the Niskramanam ceremony, which is performed when Sri Madhava is taken out of the house for the first time, followed by the name giving ceremony, the hair cutting ceremony, and the piercing of Lord Krishna’s ears. Sri Nanda Maharaja goes for a pilgrimage, and upon his return, out of affection he smells his son’s head, which is called Putra Murdhabhighranam. Thereafter, the Vidyarambha ceremony is performed to inaugurate the starting of Sri Madhava’s education. His Grace Jananivasa Prabhu represents Garga Muni, who teaches Sri Madhava to write His first words, and then grants Sri Madhava Vedic initiation and gives Him the sacred thread in the Upanayanam ceremony. Once Sri Madhava receives His sacred thread, He goes out to beg dakshina for His guru, and all the assembled devotees gather around Him and give donations. Throughout the day, ecstatic kirtan is performed for Sri Madhava, leading up to His grand Maha Abhisek ceremony, which takes place at 10 pm and continues until midnight. For His abhisek, Sri Madhava along with Srimati Radhika comes down from the altar, and They are opulently welcomed and are then bathed with numerous items. They are bathed with Panca-gavya – the five sacred items from a cow – and are then bathed with milk, yogurt, ghee, honey and sugar water, which are known as the five nectars. They are also bathed with seasonal and colourful juices, from fruits such as mangoes, grapes, pomegranates, oranges, watermelons, and papayas. Water scented with saffron, rose, aguru, musk and kusha grass is also used to bathe Their Lordships, and fragrant flower waters made with flowers such as rose, bakul, lotus, jasmine, and gandharaj. Radha Madhava are also bathed in coconut water and are given two kinds of showers: Sarva Aushadi and Maha Aushadi, which use natural medicinal and herbal substances to bathe the Lord. After being bathed in these various substances, sandalwood paste is applied and then washed off of Radha Madhava’s forms with a steady shower of pure Ganga water. Once the Lord’s elaborate abhisek is completed, Their Lordships are dried, and They are then showered in flower petals before They return to the altar to be dressed in fresh clothes. The devotees of the community, with much love and devotion, cook over 400 preparations to offer to Sri Sri Radha Madhava for Their grand bhoga offering. Once Their Lordships have honoured the preparations offered to Them, the altar opens and Sri Sri Radha Madhava give a breathtaking darshan in Their new night outfit, and at midnight a Maha Arati is performed while all of the assembled devotees engage in an ecstatic kirtan. Once the deities retire for the night, an anukalpa feast is served to everyone, and the blissful day of festivities comes to an end. 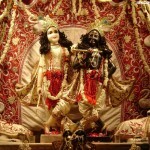 All glories to Sri Krishna Janmastami!